I was very tempted by this author’s previous novel Reconstructing Amelia but sadly didn’t get around to reading it, so when I saw this one on NetGalley I was keen to give it a try. And boy does this book start with a bang! Molly Anderson has joined the local paper in Ridgedale, a big step since she had suffered a stillbirth eighteen months earlier and had suffered with severe depression as a result. With the help of her husband Justin and a move to a new area Molly is slowly becoming more confident in parenting her daughter Ella and hoping to make new friends in the area when she is asked to stand in for the chief reporter as he is in hospital. Molly makes her way to the edge of Ridgedale University campus where a body has been found – to her horror the body is that of a very small infant. The question is whose baby is it? Will Molly be able to put her grief to one side and report on the issue without it compromising her recovery? With the truth being revealed in pieces the author cleverly maintains the tension and this story had me gripped as I wanted to know the secrets that were hiding in the various strands because this book isn’t just about the baby’s body, this small community where crime is rarely committed is hiding a lot more. I enjoy it when books have a decent range of characters both in terms of age and situation, and the Rigedale community is well represented in this tale. Kimberley McCreight presents us with a wide range of characters including some that first appeared to be real horrors, although through the excellent writing I later grew to understand some of them, if not like them. A very satisfying and intricate novel which I really enjoyed, this is very much a character driven novel and although the police are involved to be honest it is lucky for them that they have someone who is as keen to get answers as Molly because they don’t seem to have much of a sense of urgency, or even the most basic detection skills. I’d like to thank the publishers Simon & Schuster for my copy of this book in return for my honest opinion. 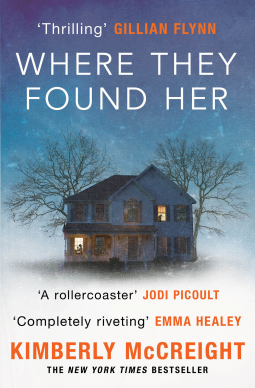 Where They Found Her was published yesterday 24 September 2015 here in the UK. Interesting that you say you are a fan of multiple viewpoints, as I often find I am not – but that’s perhaps just when they are not well done. It does depend on the quality – I was really taken with Emma Kavanagh’s books earlier this year as much because of her excellent use of this device as the story, but I think we’ve all read stories where it doesn’t add anything or worse still appears just to slow down the revelations! Interesting she uses a variety of characters like that, Cleo. And it sounds like a solid character study, among other things. Glad you enjoyed it. I do like it when books explore the workings of a person – this one met that need really well Margot. I loved this one too – and Reconstructing Amelia – and wrote a spoiler discussion on my blog! I’ve just read your spoiler and some of your wrong guesses matched mine especially about the Captain…. I will say no more! I now need to read Reconstructing Amelia. It is incredibly sad and as you say there are obvious leads to pursue. I enjoyed this one, too, and like you, really connect with a story with multiple perspectives that add pieces to the story. Thanks for sharing! I did like the way the author handled the multiple viewpoints especially as it didn’t feel like the device was used to deliberately slow down the revelations. I like the sound of this, including he multiple viewpoints. One for the list! I think you will enjoy this one Linda – there is quite a lot going on which makes it feel quite clever. I love multiple viewpoints too, but also only when it’s done well, and I find that almost every book I read these days is from multiple viewpoints. It does a lot to round out the story, but sometimes it might be nice to just get one person’s perspective again! And yes, definitely read Reconstructing Amelia. It’s another very intricate one like this!